If nothing changes between now and May 1, 2013, homeowners will have fewer choices when it comes time to replace their furnace. Way back in 2007, congress put together something called the Energy Independence and Security Act of 2007. The general idea of the act is to reduce dependency on foreign oil, and it is a pretty all-empcompassing bill that addresses everything from Average fuel economy to biofuel research. Something else it did was give the Department of Energy the authority to set regional standards for furnace and air conditioning efficiency. What the DOE did with that authority is split the country into three regions - North, South, and Southwest. Those regions were then assigned minimum efficiency standards for Heating and Air Conditioning. What that really means for us northerners (and everyone living in Alaska, Colorado, Connecticut, Idaho, Illinois, Indiana, Iowa, Kansas, Maine, Massachusetts, Michigan, Minnesota, Missouri, Montana, Nebraska, New Hampshire, New Jersey, New York, North Dakota, Ohio, Oregon, Pennsylvania, Rhode Island, South Dakota, Utah, Vermont, Washington, West Virginia, Wisconsin, and Wyoming) is that as of May 1, 2013, we will no longer be able to install 80% or less efficiency furnaces. The reality is that things will begin to wind down sooner than that as suppliers and dealers (like us) do not want to become the proud owners of equipment that is no longer legal to install after the deadline. Click the image below for a helpful article explaning in further detail what you can expect. Image provided by ACCA.orgSo who does this really affect? It really affects anyone that currently has an 80% or lower efficiency furnace. How do you know if that's you? If your furnace exhausts out of a metal pipe through your roof, your furnace is 80% efficient or lower (see image below). If you have PVC (plastic) pipes running through your walls or roof, you already have a high efficiency (>85%) efficient unit and this change won't affect you. So, let's assume you have metal flue - what shoud you do? If your furnace is more than 15 years old and you either 1) Are planning on selling your home within the next couple of years, or (2) Have the furnace in the middle of a finished basement or condo with no easy way to get to an outside wall, you should strongly consider having your equipment replaced before next May. The reality is that high efficiency furnaces cost more to install (if you're going to sell) and require PVC venting to go through either the roof or sidewall of the home (which can be difficult if not impossible in some situations or require extensive reworking of finished areas of the home). It would be nice if everyone could install high efficiency (95% and higher) equipment in their homes to take advantage of lower utility costs and lower environmental impact, but not everyone can afford to or have the space and open areas to install the necessary venting. If you can accomodate high efficiency equipement you will benefit from lower natural gas or propane usage from the increase in efficiency, improved indoor air quality from the use of outside air for combustion, and the potential for greater comfort with multi-stage and variable speed options. Do yourself a favor - take a few minutes to investigate what kind of furnace you currenty have installed and see what kind of condition it is in to determine if you should maybe be thinking about getting a new furnace that works for you while you still can. Or, better yet, call us today for a Precision Tune-up on your existing equipment as well as an honest evaluation of your equipment and potential for installing High Efficiency equipment. The last thing I want to happen is come June and someone that really NEEDS an 80% efficient furnace installed simply won't be able to. on 2013-02-28 15:13 by Illiana Heating & Air Conditioning, Inc.
UPDATE TO UPDATE: Apparently it's not all cut and dried yet - the Court must still accept the settlement to finalize things. Until we hear from the court, installing 80% furnaces remains legal, but if the court does not accept it, the May 1st date stands. As a result suppliers continue a wait and see approach to stocking 80% furnaces and supply is getting harder to find. In a settlement filed late Friday afternoon, the Department of Energy (DOE) has agreed to withdraw the pending efficiency change for residential and mobile home gas furnaces. According to the terms of the settlement, the minimum AFUE standard change from 80% for 90% in the Northern region is vacated, along with the pending May 1, 2013 compliance date. Pending the court's acceptance of this settlement, non-condensing (80%) furnaces remain legal to install in all states until further notice. 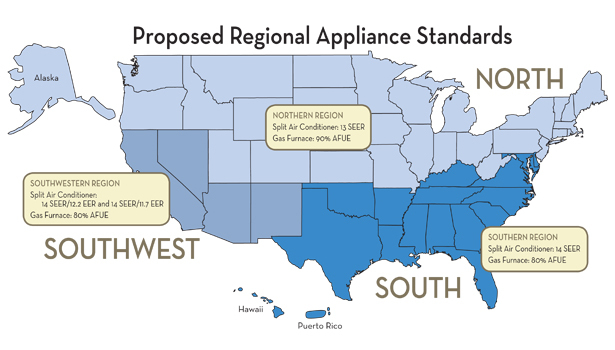 The DOE will initiate a new rulemaking for minimum energy conservation standards for residential furnaces and allow stakeholders the opportunity to comment. The portions of the Department of Energy's Efficiency Standards change setting new minimum energy efficiency standards for central air conditioners and heat pumps, including any regional standards, remain in place, along with the January 1, 2015, compliance date. So, apparently the heat is off for now, but the reality is that I'm certain we haven't heard the end of this and if you currently own an 80% furnace and have no realistic option for getting PVC flue pipes out of your walls or roof, you should strongly consider replacement sooner than later. Supporting document of this decision can be found here.